41 Hawthorn Sugar Dot Print Dress. When I opened the box, I thought this would be the piece I liked the most. The fabric has a cute dot print and a nice drape. I like the feminine styling. However, when I put it on, the bottom is quite full, and it made my hips look extra-wide, which is not what I am going for! Unfortunately, this was a return. 2. Donna Morgan Guilia Jersey Faux Wrap Dress. These two dresses definitely prove that you have to try clothes on to really tell what will work. I did not love this dress at first sight. The print was too much of a statement for me, and I thought I wanted something more refined-looking. However, when I put it on, it fit so perfectly, and the style and print are super-slimming. My stylist Erin suggested wearing this with a short trench coat, so I tried it with both a beige blazer and a grey cardigan. Both did a nice job of toning down the print a bit. I had to sleep on this decision, but in the end, I am excited to keep this dress. 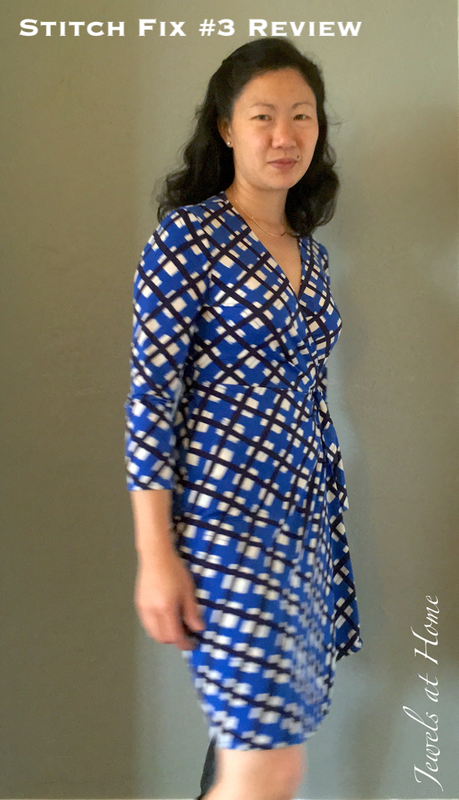 One of the main reasons I signed up for Stitch Fix was to get introduced to new styles that I would not pick out myself, and I think this dress definitely achieves this. 3. 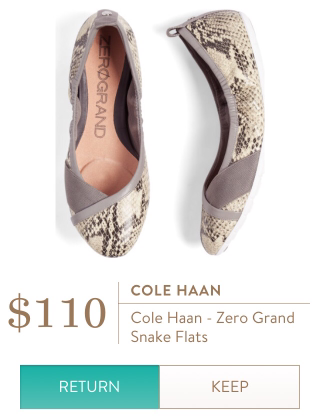 Cole Haan Zero Grand Snake Flats. These are actually nice shoes. Cole Haan has good quality shoes, and these are very comfortable, with a bit of a sporty sole. I like these, but I didn’t keep them, because I have a gazillion ballet flats already, and these were a bit expensive for something that is very similar to other shoes I own. 4. 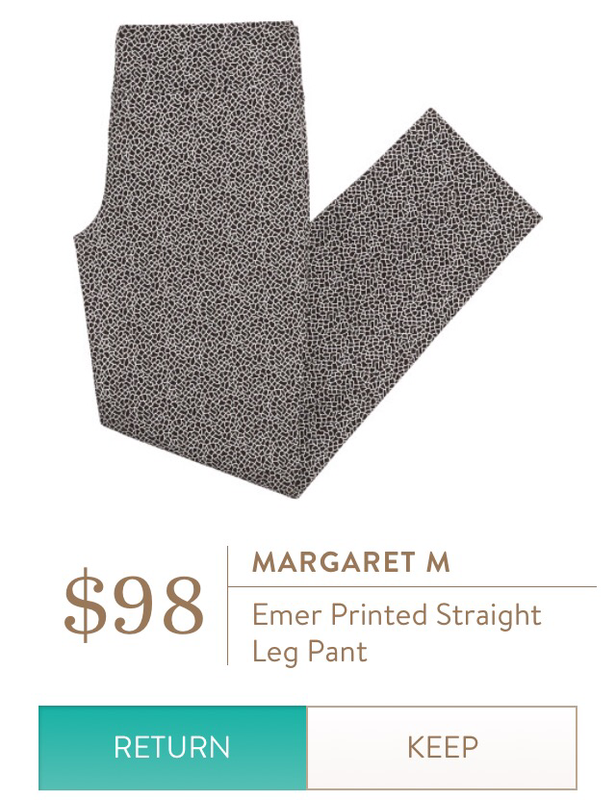 Margaret M. Emer Straight Leg Pant. This was the big miss in Fix #3. I has asked for a pair of interesting dress pants for work, and these really did not meet my expectations. They are very stretchy, basically like leggings, and I don’t consider them to be dressy or flattering at all. I don’t think you can call yourself work pants if you are so stretchy that you don’t need a fly to put them on. Bummer. 5. 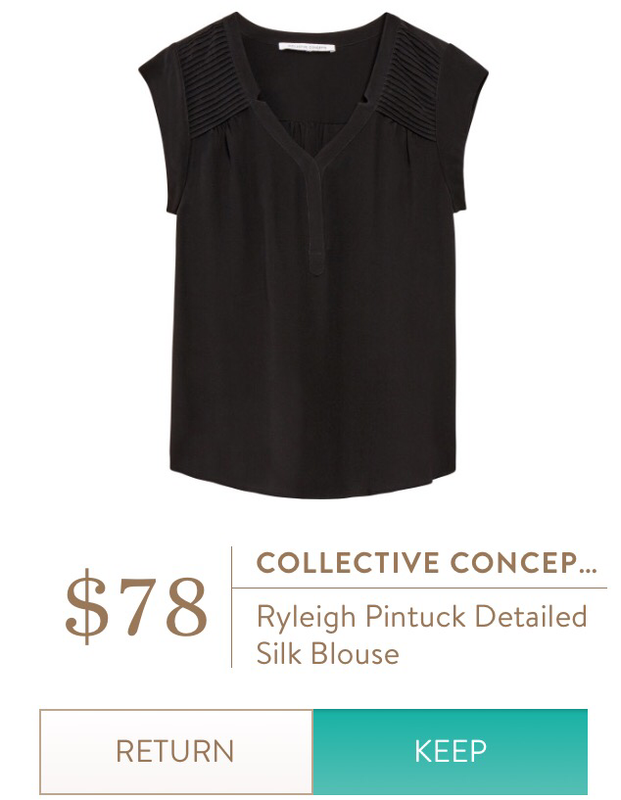 Collective Concepts Ryleigh Pintuck Detailed Silk Blouse.This blouse was the sleeper hit of the fix. Kind of like the jeans from fix #2, which I thought were kind of boring when I first saw them and have become my absolute favorite jeans. 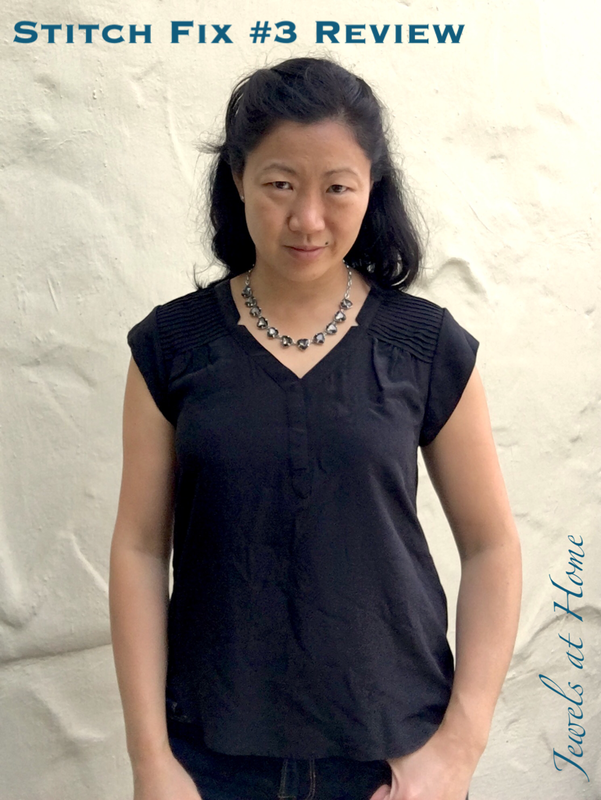 This top looked pretty plain, but when I put it on, it fit perfectly and the little details around the collar and shoulders are so pretty. The cap sleeves look great, and I can see myself wearing this a lot! So, I kept two out of five items this time, which is the same as last time. I did like the shoes as well and would have kept them if I didn’t own so many ballet flats already. So, it is really the dotted dress and the pants that didn’t work. I think my overall impression was initially negatively colored by the fact that I was so disappointed by the pants, since that was the only item I actually requested. However, having fallen in love with the top and the wrap dress – which is something I would never have guessed I would like, I do think that I am getting what I want out of this service, which is discovering new styles that I wouldn’t find myself, not to mention the excitement of opening a surprise picked just for me! I’m planning on ordering from Stitch Fix again, though I haven’t put it on the calendar yet. I’ll be sure to update you when it comes! In the meantime, if you want to try them out, I’d appreciate if you use my referral link.